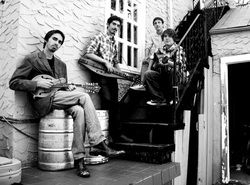 ﻿Jasper's Cast﻿ is a Folk Rock/Americana band out of San Antonio, TX. Combining bluegrass instrumentation (mountain dulcimer, mandolin, acoustic guitar) with electric amplification and influences from the rock music of Wilco, Jack White, and Led Zeppelin, the band creates music that can't fit into a particular genre. Vocal harmonies, improvisational solos, and energetic live performances also define the band's eclectic style. Formed in 2009, Jasper's Cast has released three studio albums, Jasper's Cast EP (2010), City Lights: How I Learned to Love the City (2011), and Blue Northern (2012). The band parted ways in 2013 to explore other projects. Ronald Ray Gun's style can be characterized as a "shred-heavy, synth-happy approach to '90s alt and indie rock." Influences include early Flaming Lips, Pavement, and other 90's alt rock bands. Formed in 2012, Ronald Ray Gun released it's full length studio album, What's So Funny About Pizza and Understanding? in 2013. King Minty Philosophers was a collaboration of three young musicians with three distinct styles of music: flamenco guitar, bluegrass mandolin, and modern jazz-influenced mountain dulcimer. The short-lived project was captured in one full-length eponymous studio album recorded in Katy, TX in 2009 by local mountain dulcimer legend Quintin Stephens. "Pathways" by Quintin Stephens is a collection of original music and arrangements for the mountain dulcimer by one of the master songwriters and dulcimer players in the business. It includes the original song "The Pathway" and the dynamite instrumental, "Thunderstorm on the Horizon." It is Stephen's latest full-length album. Eric's Role: co-songwriter and mountain dulcimer on Track 1, "Park Avenue," mountain dulcimer on Track 8, "Scotland the Brave"